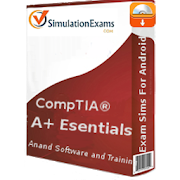 Complete explanation is provided for each question in Learn mode, and actual exam environment is simulated in Exam mode. User would be able to save test results and review the questions with answers at a later time. Night/Day modes, font size adjustment, and bookmarking features are available. Other tests available include Network+, Server+, and Security+.